Norbert Blei born in Chicago, the author of a trilogy concerning that city and its people, Chi Town, Neighborhood, and The Ghost of Sandburg’s Phizzog has lived in Door County, Wisconsin since 1969 and written extensively about Wisconsin as well. He has taught, lectured, given writing workshops throughout the state and the Midwest, and is the Writer-in-Residence at the Clearing (Ellison Bay) where he has guided beginning and advanced students in the art of fiction, nonfiction, and poetry for more than twenty-five years. He has published in many of the state’s leading periodicals and literary magazines, and is a frequent commentator and guest on the Jean Feraca show (Wisconsin Public Radio) and has appeared on Warren Nelson’s Tent Radio program (Lake Superior Big Top Chautauqua), and the Michael Feldman Show (WPR and NPR). For three years he was a featured commentator on a local literary/ arts program in Door County, “Passages” (WDOR FM 98.7) and had his own hour program of commentary, interviews, readings, blues and jazz, called “The Coyote Hour” on WBDK, FM 96.7. In 1985 the Wisconsin Library Association honored his literary contribution by designating him a Notable Wisconsin Author, and he is included in Jim Stephens’ three-volume literary history of Wisconsin, The Journey Home. In 1997 he received the Gordon MacQuarrie Award from the Wisconsin Academy of Sciences, Arts and Letters for his outstanding work in nature and environmental writing. He is one of 64 writers whose work was architecturally incorporated in a new convention center, the Midwest Express Center, in downtown Milwaukee. 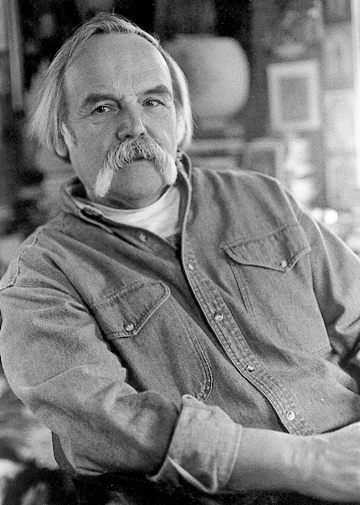 In 1999 he received the Harry Bradley Major Achievement Award from the Council of Wisconsin Writers for significant literary achievement. He is also a Pushcart Press award winner for fiction. Blei is the author of seventeen books: fiction, nonfiction, and poetry and has received state, regional, and national awards. In December of 1994 he started his own small press, CROSS+ROADS PRESS dedicated to the publication of first chapbooks by poets, short story writers, novelists and artists. He was a contributing editor to the national quarterly, FORKROADS, A Journal of Ethnic-American Literature; co-editor of The Door Voice, the literary/associate editor of The Peninsula Pulse, and a columnist/feature writer for the online publication: www.doorcountycompass.com. His nonfiction has appeared in the Chicago Tribune, Chicago Magazine, the Washington Post, etc. while his short stories and poems have appeared in numerous literary anthologies, textbooks, and magazines including the Minnesota Review, Tri-Quarterly, Story, Kenyon Review, Utne Reader, and The New Yorker. His Wisconsin work includes the award winning trilogy: Door Way, Door Steps, Door to Door, as well as Meditations on a Small Lake and the controversial Chronicles of a Rural Journalist in America–dedicated to the preservation of the rural landscape. Works-in-progress include a novel set in Door County, three collections of short stories, and four books of nonfiction. His most recent works include Winter Book and the first tradeback edition of CHI TOWN published by Northwestern University Press.